Simplicity is something you don't see a lot of. With added embellishments and a mindset of the fancier the better, sometimes it can be nice to find something that is simple, without a lot of extras. Our 7mm designer Argentium silver step down wedding ring with satin finish and polished edges fits the bill. 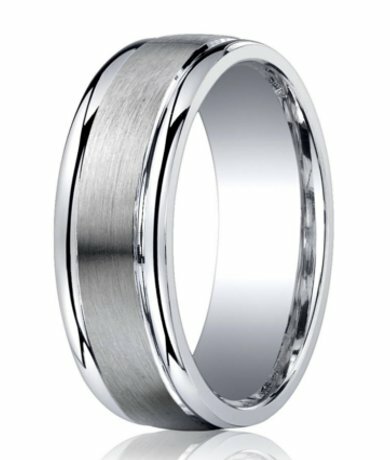 For men who cannot decide between a satin or polished finish, this Argentium silver polished step down wedding ring offers the best of both worlds. At 7mm wide, it has a flat satin center that is accented by polished edges that sit slightly below the center, giving it an elegant designer look. Even with the contrasting center and edges, it offers a quiet simplicity, perfect for your groom. Before placing your order, we recommend having your groom's finger sized by your local jeweler. Comfort fit rings usually measure ½ size smaller due to the additional metal inside the ring. When you're trying to juggle getting what you want and staying within your wedding budget, it can be tricky, but we make it easier than ever. Our 7mm designer Argentium silver step down wedding ring with satin finish and polished edges is high-quality, comfortable, affordable, and stylish. We even offer custom engraving up to 30 characters for you to add the date of your marriage or a meaningful quote. Lovely ring, a little duller than pictured. Very happy with this quality ring, however the polished edges are not quite as bright and the satin finish is not quite as dark as pictured in the photograph above.